NEW thrills for players and spectators, and novel aids for practice, are provided by the latest inventions in the field of sport. 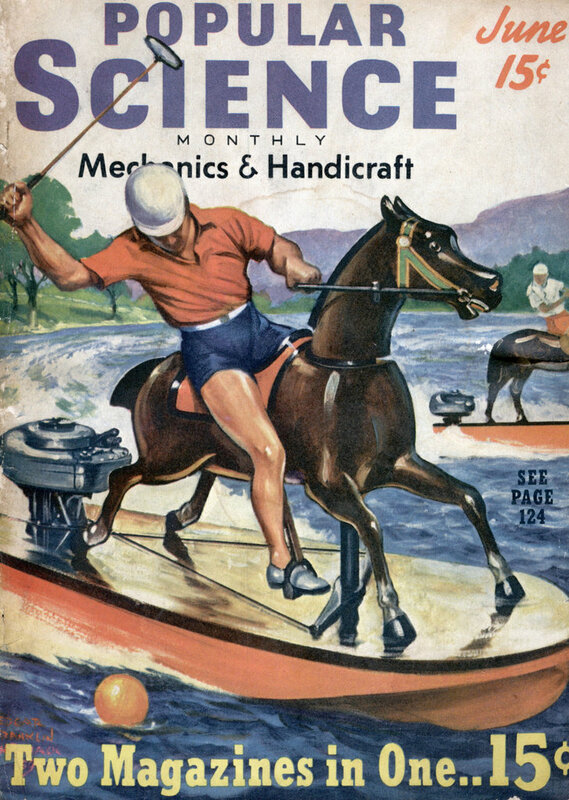 Polo becomes an exciting aquatic game when played on mechanical steeds, skimming the water under the power of husky outboard motors. A ring-shaped grip controls throttle and rudder, leaving the player with one hand free to strike the floating ball. In baseball games, a new electric umpire takes the guesswork out of calling “balls” and “strikes.” When a ball passes over the plate at the proper height, it intercepts two light beams, actuates corresponding electric eyes, and lights an indicator. With another baseball invention, a pitcher can practice without a catcher. A black oblong serves as a practice target. The spent ball drops into a pocket at the base. When the pitcher steps on a pedal, a mechanical arm throws the ball back to him. 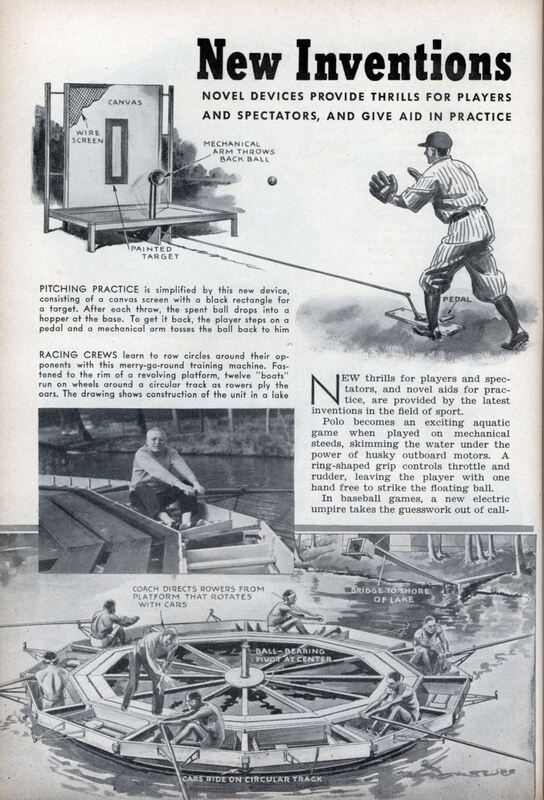 For batting practice, a new aid tethers a baseball on a cord running over pulleys. In Asheville, N. C, a merry-go-round rowing machine trains racing crews handicapped by the short practice courses available. Fastened to the rim of a revolving platform, twelve “boats” travel on wheels around a circular track. All of these are just silly. a complicated return over just a catcher? why do the polo players’ vessels have to look like horses? what about the rowers who use port-side oars? and that’s just a teeball on a rope.